Hundreds of different solutions exist to reduce the resolution of photos. These solutions are available as software programs but also online services. Quality is usually not an issue when reducing the resolution of a photo. It does becomes problematic on the other hand to find a solid computer program to enlarge photos. Enlarging photos meaning to increase the resolution of the photo so that it becomes available in a higher resolution. This can be very useful in situations where low resolution photos have been created by a digital camera or cell phone. Smilla Enlarger is a portable software program for the Windows operating system that can be used to enlarge photos. The results depend on the resolution and quality of the source photo and the resolution increase entered by the user. They do look pretty good on average though making Smillar Enlarger one of the few valid one-click solutions to enlarge photos. The program basically works the following way. The user loads a photo into the software program. The photo will be displayed automatically on the left side of the interface. A suggested new resolution will be automatically selected and a zoomed in area of the source photo will be displayed on the right side. 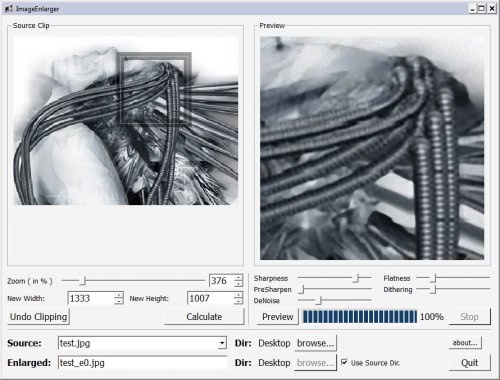 The target resolution of the enlarged photo can be changed by moving the zoom slider or by entering a value for the width and height manually. It is possible to change the area that is being used for the preview to ensure that the most important areas of the photo display fine in the new resolution. The controls at the bottom can be used to fine tune the enlarged photo further to increase the overall quality. The following five controls are available as sliders in the program: Sharpness, Flatness, PreSharpen, Dithering, DeNoise. A click on the calculate button will start the photo conversion. The enlarged photo will be saved in the source directory by default. Smilla Enlarger (via Essential Freebies) is a great software program for users who want to enlarge some of their photos or images. HELP!!!! I have downloaded smilla enlarger and have this wonderful little zipper icon in my documents but I can’t get it to open. I get the read me file, the download icon, but the program window won’t open. I am a complete computer idiot, so if you can please help. The little zipper icon means it’s a ZIP file. search ‘zip file extractor’ from google and download it. open zip file with that zip file extractor you download.